"What would you do if you knew you could not fail?" These words, attributed to First Lady Eleanor Roosevelt, have inspired tens of millions to face their fears and dare to follow their hearts. This can-do compendium is a veritable tool kit for transforming listeners from reticent to role model.... From the authors of Living Life as a Thank You, this volume presents true stories of ordinary people with extraordinary fortitude. 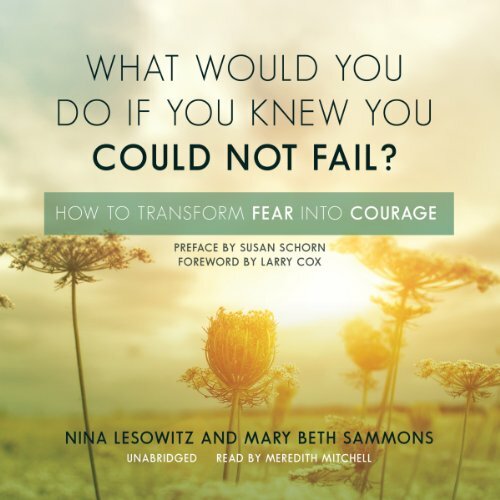 Authors Mary Beth Sammons and Nina Lesowitz have gone to the frontlines of adversity and fear to surface the brave hearts who took action before they were forced to, confronting and overcoming their fears in inspirational ways. From world-class athletes to spiritual teachers to cancer patients to ordinary people who took extraordinary action to transform their lives, these courage warriors teach listenrs to turn apprehension into action. Enriched with motivational quotes and power practices, this courage guidebook advises how to live life with guts and gusto. Readers learn to face and transform their fear, apply the art of tenacity when times are tough, embrace the lessons and gifts of a crisis that lead to personal growth, and simple, effective, and proven methods for confidence and courage. If you could sum up What Would You Do If You Knew You Could Not Fail? in three words, what would they be? Multiple stories that inspire you to step from the normal shade casted by society. It explains courage is having enough conviction for your belief to out/over step boundaries to get your life's true goal accomplished. What three words best describe Meredith Mitchell’s performance?